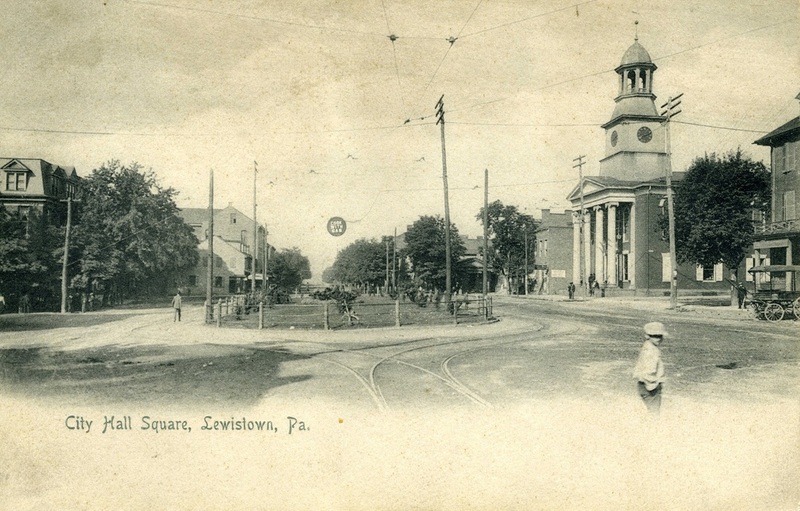 "Progress Lighting the Way for Commerce"
One favorite local pastime was to leisurely stroll the main streets of Lewistown and window shop. 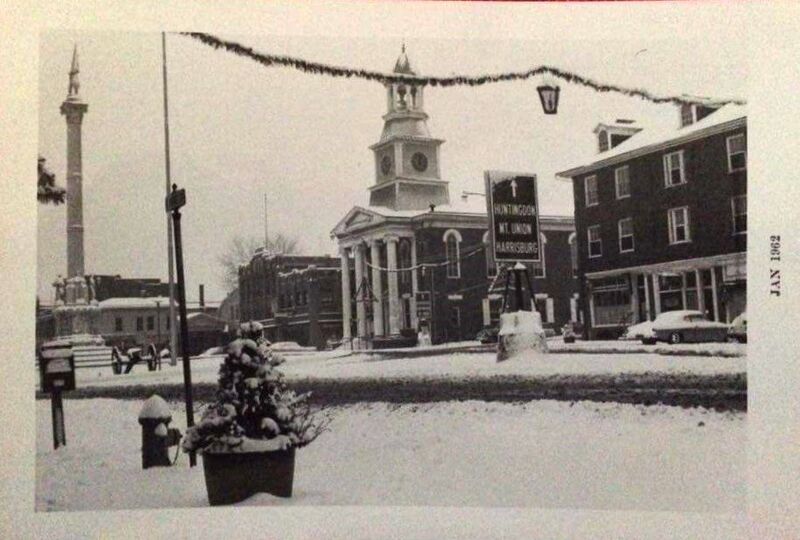 Shoppers could walk the length of Market Street to see the seasonal displays at every business, from McMeen’s Department store to Wolf Furniture, plus so many more that are now just memories. One window to check out was on the Square at the Montgomery Ward store. 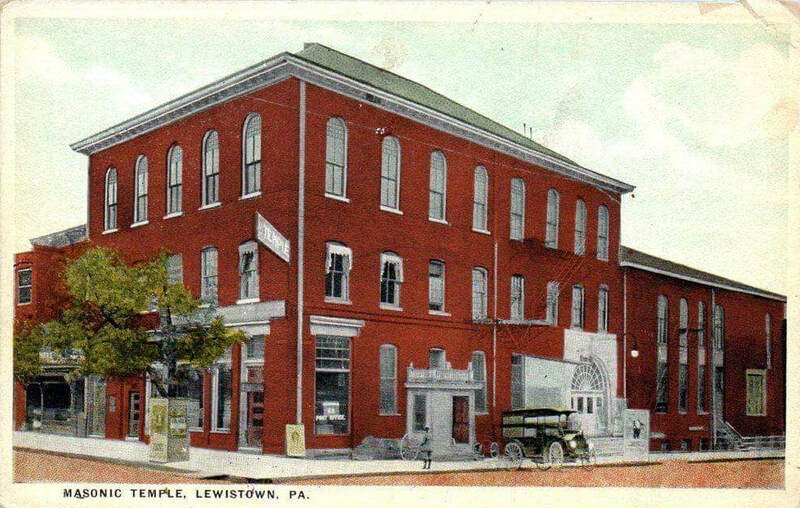 Though the company is long gone from Lewistown, the business’ unique building, completed in 1929, is a reminder of commercial life over eighty years ago. The Montgomery Ward Building, prominently located at 3 West Market Street beside the historic Mifflin County Courthouse on the Square in Lewistown, is an impressive example of Art Deco style architecture. The building has been on the National Register of Historic Places since 1984, recognized for its unique architecture and its significance as an early member of Montgomery Wards’ chain of retail stores. Tens of thousands of area people shopped at Wards since the building’s construction over eighty years ago. 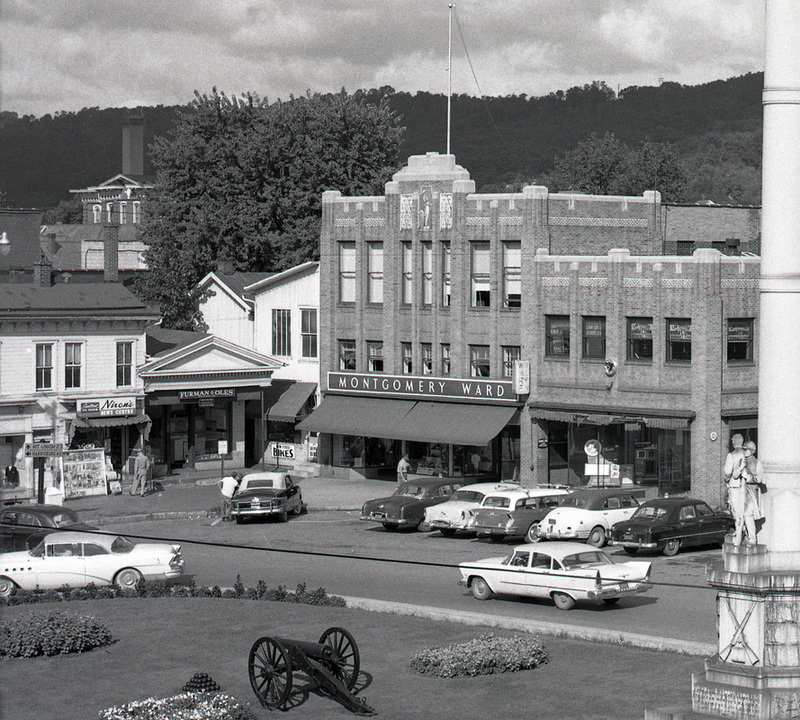 The structure emerged from a fire in 1936, plus numerous remodeling, as well as the closing of the Wards store it was meant to house decades later. Utilized today for offices, the building also houses the Mifflin Juniata Arts Council Gallery, while the Mifflin County Train Club’s extensive model layout in the basement is a popular draw during of the annual Festival of Ice. The building is a fine, intact example of the restrained Art Deco style used by a number of chain stores in the 1920s and 1930s, according to the 1984 application for its inclusion on the National Register. 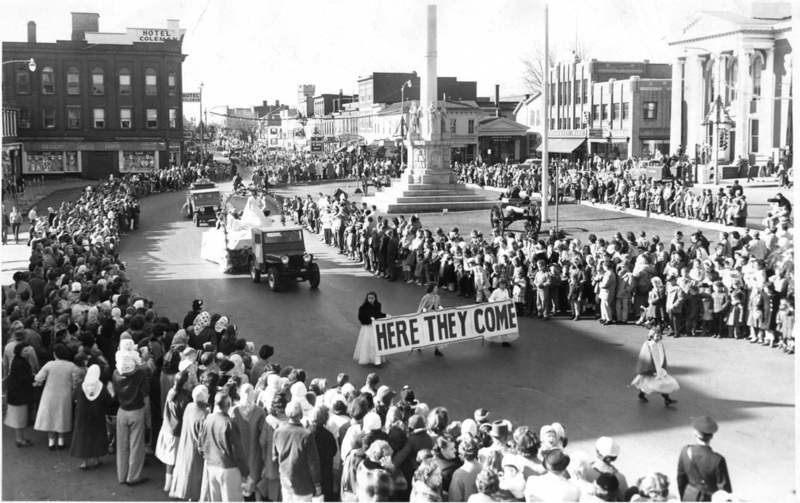 The style was spreading into small town America at the time, suggesting a community’s sophistication, and presenting a modern, up-to-date appearance to visitors. Built in 1929 by mail order giant Montgomery Ward and Company, the building is also significant as one of Ward’s initial full-line department stores scattered across the United States in the company’s efforts against competitor Sears & Roebuck. 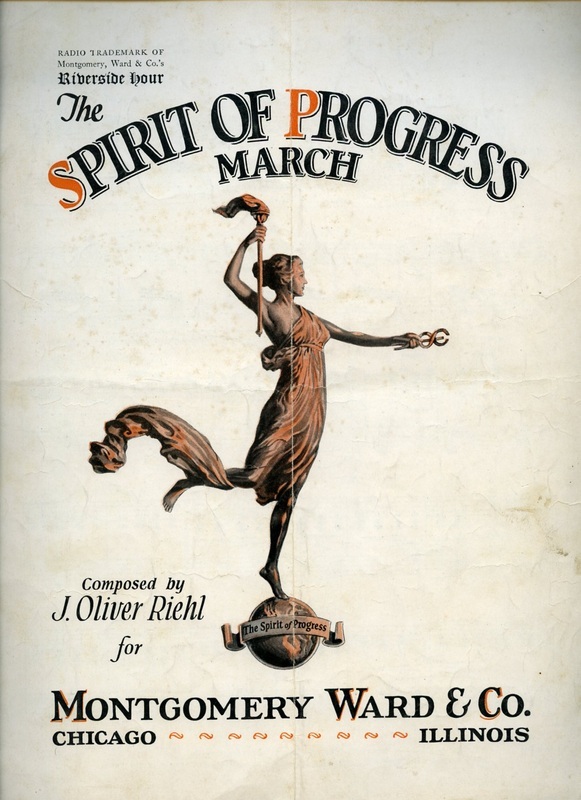 "Progress Lighting the Way for Commerce", a torch-bearing female figure in diaphanous robes, was designed for the company by Scottish-American sculptor J. Massey Rhind. Her likeness often appeared in medallion form on many of Ward’s stores, including the Lewistown building. It is a feature high on the structure’s façade facing Monument Square, a diminutive rendering of the 22-foot colossal weathervane likeness placed atop the company’s Chicago headquarters at the turn of the 20th century. 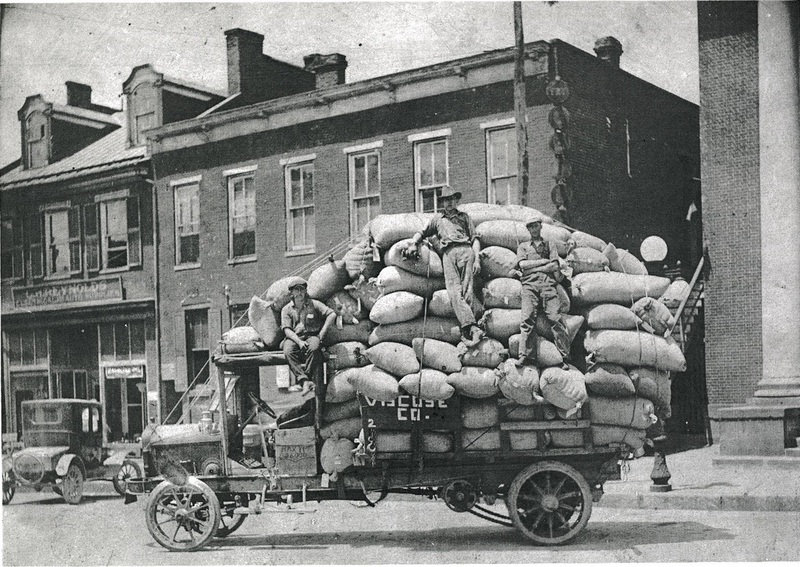 The Montgomery Ward Company, founded in 1872 by Aaron Montgomery Ward, is considered the world’s first mail order business, gaining its strongest supporters in rural areas through its illustrated catalog. Just three years later, Ward attracted more customers with the novel and unmatched advertising strategy of "satisfaction guaranteed or your money back". At its height, it was one of the largest retailers in the United States. In 1896 Wards acquired its first serious competition in the mail order business, when Richard W. Sears and Alvah C. Roebuck mailed their first general catalog. In 1900, Wards had total sales of $8.7 million, compared to $10 million for Sears & Roebuck. The two companies would struggle for dominance for much of the 20th century. In 1926, Wards broke with its mail-order-only tradition when it opened its first retail outlet. It continued to operate its catalog business while pursuing an aggressive campaign to build retail stores in the late 1920s. 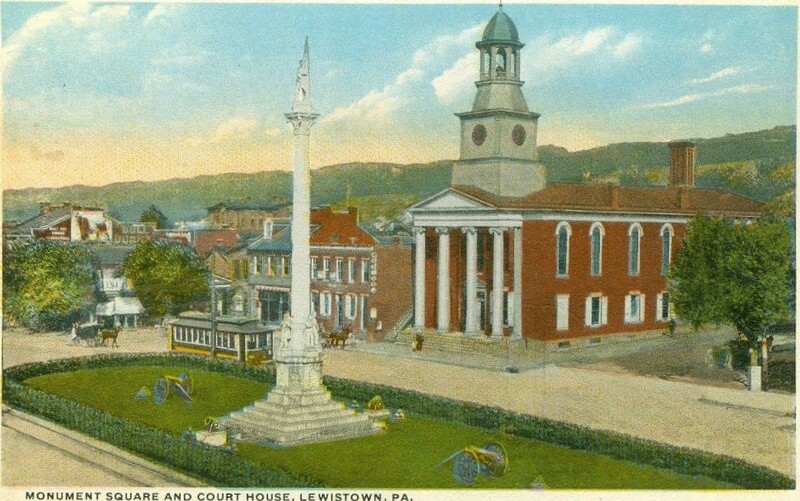 The company had 531 outlets, one being the Lewistown store, by 1929. 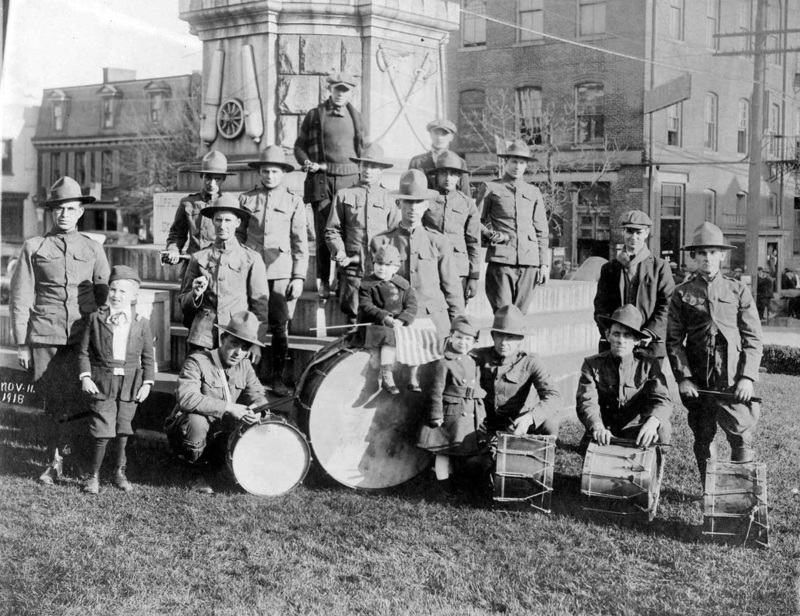 York, Pennsylvania architects C. Frank Witman and John B. Boyer attended the ground breaking for the Montgomery Ward Company, as did Lewistown attorney A. Reed Hayes. 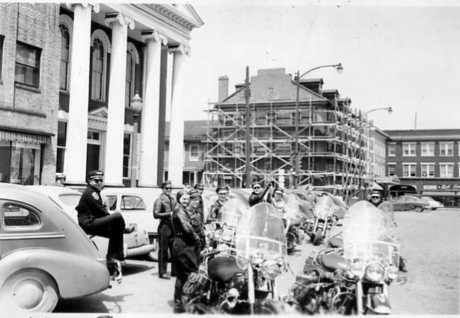 Building began in the Spring of 1929 by general contractor W. D. Steinbach and Sons who used all local craftsmen, according to news reports. The contractor’s site manager also was quoted as saying he, “...never had seen better materials and workmenship...than found here...” Some of the Art Deco architectural details include two-story bay windows and pilasters, bands of glazed terra cotta panels and a female figure holding a torch. This image was a standard Montgomery Ward logo known as the “Spirit of Progress.” An identical panel is located on the former Montgomery Ward building in Stroudsburg, PA. The original drawings for the Lewistown store indicate the panel was made by the Atlantic Terra Cotta Company expressly for Montgomery Ward. Sentinel headlines trumpeted the opening Saturday, October 26, 1929 - THOUSANDS AT STORE OPENING - Crowds Thronging Montgomery Ward & Company Store Today on Opening. Visitors entering from the front could walk to the back of the store and could go to departments in the basement or on the second floor. Directories of the goods on display were placed throughout the store. The mezzanine level offered attractive women’s clothing. The basement was filled with tires, hardware, bathroom fixtures and sporting goods. The newspaper noted, “Stoves played no small part of the basement displays.” Furniture, radios, and rugs were “ found galore in a pleasing arrangement on the second floor.” Female clerks were “attired nattily” in blue smocks with the letters “MW” on the sleeve. Just days later, November 1, 1929, the Penn Central Light and Power Company formally opened its new headquarters at 3 West Market Street, next door to Wards. It was identically styled, though not as tall. Four thousand roses were given out to the women visitors at Penn Central and the new display windows, also like those at Wards, made an excellent display area for the lamps, appliances and other merchandise sold by the company. Law offices were located above the power company and years later WMRF Radio would be located there, too. Early on the morning of December 21, 1936, a passerby smelled smoke emanating from the Wards Building. By 2:30 A.M. policeman Walter J. Tomlinson discovered smoke pouring from the basement ventilators and firemen were called. It took five hours and the injury of eleven fire fighters before the blaze was under control. To make the fire fighting even worst, ammunition from the sporting department exploded driving back the firemen. A hole was cut through from the Penn Central side to gain access and extinguish the blaze. 65 employees were thrown out of work, but Wards renovated and the store was placed back in business. 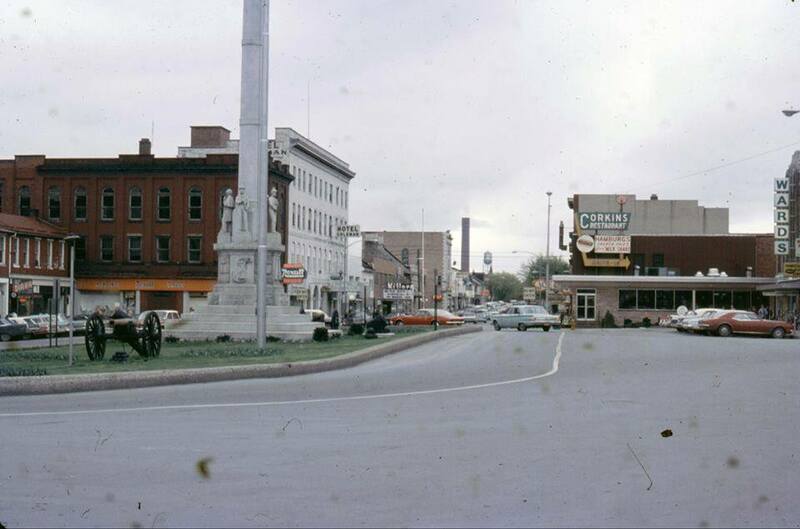 Wards operated the department store on Monument Square until the 1970s, when it closed along with many of its other retail outlets across the country. America’s buying habits had changed and discount giants became the norm. The building, acquired by OK Properties of Lancaster, PA in the 1980s, was extensively renovated for offices. OK Properties also successfully applied for and secured the Montgomery Ward Building its National Register status in 1984. 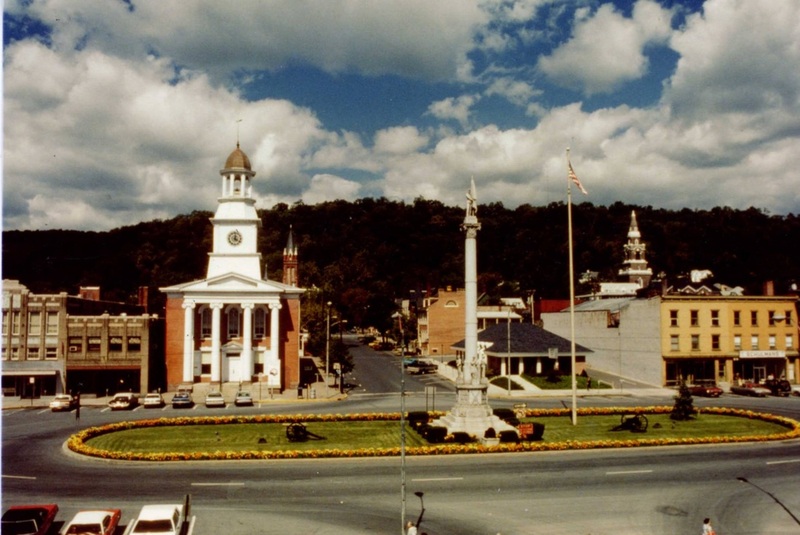 During the Mifflin County Bicentennial in 1989, street level offices in the building became headquarters for the Bicentennial Committee, its gift shop and the many activities involved with the yearlong celebration. Today, the 1929 Montgomery Ward Building is still a grand presence on the Square. The original storefront can be seen at street level beside the historic courthouse. The Mifflin Juniata Arts Council Gallery occupies the other side at street level. Arts Council president Angela Niman commented at the gallery’s opening in 2012, "The building of 3 West Monument Square is one of the original Montgomery Ward buildings constructed in 1929. When we were discussing what our first exhibit should be, our decision was inspired by the actual building, which includes a number of Art Deco characteristics." Special thanks to Mifflin County Historic Society Research Librarian Jean Laughlin.